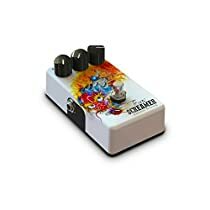 Developed in collaboration with Johnny Winter, the Texas Screamer captures Johnny's signature tone in a rugged, small foot print, 3-knob design pedal. The Texas Screamer is 100% analog with true bypass circuitry. With just 3 basic knobs: Gain, Tone and Output, it is simple to use and easy to get a great vintage, juicy rock tone. The pedal runs on 9v batteries or a 9v regulated line-in power supply and is designed, engineered and built in the USA.